What if I have underground sprinklers? If you have sprinklers please make sure that the water to your sprinkler system is turned on prior to us aerating your lawn. This will allow us to manually turn on your sprinkler system and mark your sprinkler heads. Please feel free to contact us for any concerns or questions here. After we aerate you'll probably notice the soil plugs left on your lawn. The plugs should be left to work back into the soil since they contain important nutrients and bacteria. These plugs should disappear after several mows and/or rains. Core aeration is the removal of soil plugs from the lawn. Aerating the lawn is the most important cultural practice you can do to keep your lawn healthy, disease free and stress resistant. This in turn allows for the reduction of herbicides and pesticides having to be applied to your turf. We recommend that aerations be done every 1-2 years during spring or fall. As a lawn ages, the soil beneath begins to become compacted from foot traffic, playing and weathering. This compaction inhibits the growth of plant root systems and nutrient uptake. Unfortunately, many weeds still grow well in compacted soils, often overwhelming surrounding plant life, such as your lawn grass. Core aeration is the only means of reducing or treating soil compaction. Lawn thatch is the build-up of dead grass, organic matter and roots just on top of the soil layer. This build-up can block out the sun and moisture from reaching the soil layer and is the perfect home for insects, lawn pests and disease pathogens. Core aeration breaks up this thatch layer and allows your lawn to have the breathing room it needs. Aeration allows for efficient drainage of water into the soil layer. This allows the plant root systems to have better access to water without the worry of retention or rotting. This also allows the lawn to have a much greater resistance to long periods of drought, often seen in the later summer months here in Manitoba. 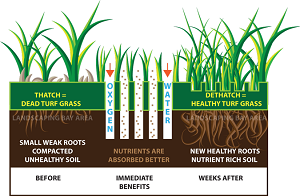 Aeration allows for greater contact between the soil layer, the atmosphere, water and fertilizers. This allows for a greater efficiency in overall nutrient uptake and production.